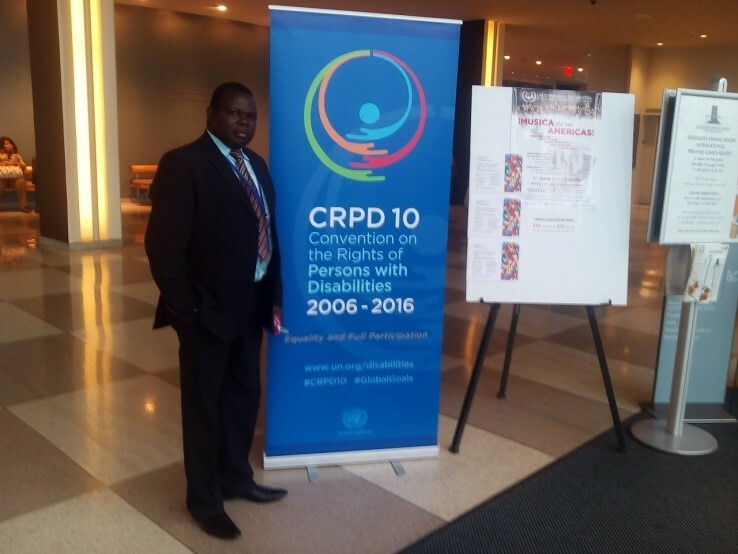 Journey Toward the CRPD in Kenya | Global Disability RightsNow! The agenda to ratify the United Nations Convention on the Rights of Persons with Disabilities (CRPD) in Kenya began some years ago when disabled people's organizations (DPOs) came together through the United Disabled Persons of Kenya (UDPK) to demand that Kenya ratify the CRPD. The goals were to provide expanded rights and increased opportunities for people with disabilities and to begin benchmarking disability rights achievements. The Kenya Disability Act of 2003 had awakened a larger disability rights agenda in the country. The disability sector wanted to go beyond this to the international level. In 2007, Kenya signed the CRPD and in 2008 the country ratified it. In 2011, the Government put together a team of officials from both the state and non-state actors to draft an initial report to the United Nations Committee on the Rights of Persons with Disabilities. DPOs in Kenya also submitted a shadow report to the Committee. Four years later, in August 2015, Kenya was reviewed by the UN Committee on the Rights of Persons with Disabilities in Geneva. The country delegation was strong and represented both State and non-governmental actors. In October 2015, we received the report of the Committee with a draft of recommendations for Kenya. The State, working closely with DPOs, instituted a working committee appointed by the principal secretary responsible for disability matters in the country to consider the recommendations of the Committee and develop a national Plan of Action to implement these recommendations. This plan was completed and launched in November 2016, giving direction and holding institutions and organizations or duty bearers accountable for implementing the CRPD in the country in a structured way. Kenya was part of the team that negotiated for the Convention on the Rights of Persons with Disabilities (CRPD) by sending delegations to international meetings from 2003 to 2006 when the CRPD was being written in New York, USA. Kenya engaged with a human rights instrument that was more binding than the earlier United Nations Declaration on the Rights of Disabled Persons. One unique strategy for Kenya was the delegations for the negotiations and the push for the CRPD included both government and civil society, reflecting the strength of cross-sectoral coalitions. The coalitions between civil society organizations and the government has worked so well in Kenya and ensured quick delivery on a number of fronts. This strategy may not be as successful in countries where civil societies make demands from a government that is not making any effort to protect rights for people with disabilities. This trend has continued every year when delegations represent Kenya each year at the UN Conference of State Parties (COSP) for the CRPD, where the State delegation has always been a team of both government and civil societies as a team. Even while drafting the initial state report to the UN Committee on the Rights of Persons with Disabilities and the consideration of the state report by the Committee, the government and civil society organizations worked together. The government partnered with civil society organizations working in the disability sector to draft a national Plan of Action to implement the recommendations for Kenya based on the initial report to the committee. The committee that guided the drafting, which was also appointed by the principal secretary responsible for disability, steered the process of drafting the Plan of Action and working with duty bearers to implement the action plan for a period of three years. The committee is chaired by the civil society and DPOs, while the government provides the Secretariat. The plan was launched recently in 2016 and now the dissemination, sharing and coaching duty bearers to implement and report is in progress. Peter S. Musakhi is Assistant Director for Social Development and Head of the Disability Unit for the Ministry of East African Community, Labour, & Social Protection, Department of Social Development and a doctorate candidate in Research, Monitoring and Evaluation in the area of disability and autism and its influence on learning behavior in view of learning environment. He is a graduate of Education in Economics and Business studies, with a M.Ed. in curriculum development studies and also Research, Monitoring and Evaluation. He has more than twenty years of experience in formulating, implementing, monitoring and evaluating programs for promoting socio-economic development among youth and among people with disabilities in Kenya. He has delivered and attended numerous high profile disability-related training sessions, both locally and internationally. These have included mainstreaming disability into development projects being implemented in Africa, best practices in implementing the CRPD, disability and gender mainstreaming in the public sector, implementing Kenya’s National Disability Policy, and more. Most recently, Mr. Musakhi served as the liaison officer for the CRPD Kenya Country Position Report and attended the 9th session of the Conference of States Parties (COSP) in New York.